Thanks to Peggy Sutton for commissioning the following for Jazz on 3. Steve Weiss was the engineer, Ben Gerrish did the transciption, and Bradley Bambarger supplied editorial assistance. Part one is about music. Part two is about Vietnam, and features audio: You’ve got to hear him tell these war stories himself. Part three is about music. “Four Hits and the Ultramodern Blues” discusses five favorite tunes. Henry Threadgill: So, tell me something about your show. Ethan Iverson: We’re taping for the BBC radio program Jazz on 3. I have interviewed Gunther Schuller, Keith Jarrett and Django Bates already. HT: How long ago did you interview Gunther Schuller? EI: About a year ago. Do you know Gunther? HT: Yes, I met Gunther. God, it’s been so long ago, and I haven’t seen him in years. I met him when he was at Dartmouth. I guess that was . . . maybe 1969 or ’70 or something like that. Richard Davis was there at that time. EI: Oh, right. Another Chicago person. So many great musicians out of Chicago. HT: Oh, yeah, you got a Midwest full of great musicians. EI: Gunther Schuller – that’s an interesting entry point. You are unafraid of classical music resources. EI: Some jazz guys would feel that classical music was off-limits. HT: . . . I’m not jazz, though. HT: That was a period. Cassandra Wilson just said that scatting belonged to a period that’s over, and it’s true. The idea of jazz was a period, too, and if you allow the word to become bigger, it’s always an expanding proposition. You gotta remember something about black music in America. People start in the wrong places in trying to put together the history of black music. When you go back to the blues in the Delta, there was no prototype, there was no template, there was no European example on how to formulate anything. The people just made that music from an aesthetic that they had that came with them from Africa. They lost any containers or forms or approaches other than the aesthetic. When you look, you see that there was no music that the slaves created basically prior to the Civil War. Do you know the reason for that? EI: Sometimes they weren’t allowed to have instruments. HT: Well, they were playing banjo, they was beatin’ on the jawbone, it was just things that was scraped together. . . but their introduction to Western instruments came about because of the Civil War. Remember the North and the South had bands; they had military bands in the North and the South, but these people weren’t professional musicians. When the war was over, they came back to the places that they came from with these band instruments, but they weren’t playing them anymore; and this was the advent of pawn shops. They dropped these instruments off in pawn shops because they were broke. Now it was possible for anybody, a poor black, white, or anything else to pick up an instrument for a dollar, or fifty cents…a used instrument for fifty cents, so there’s a violin, there’s a trumpet in the window. EI: These were ex-military instruments? EI: Sure, the little town I grew up in Wisconsin had a pagoda. That’s something you were supposed to do on a Friday night: cut the grass and then go see the band. HT: So, the introduction to these instruments is the beginning of learning how to move their musical thinking into that arena. Right? Now, the entire experience of the slave was one of assimilation. Assimilation of anything! It didn’t matter: Chinese, French, Spanish, whatever it was. It was the acquisition of all information in systems and knowledge and communication. And that was without discrimination. It was just grab hold of something and learn how to do it in some kind of way and put your thing through it. Look at Scott Joplin. He wasn’t really emulating anything from Europe. At all! As a matter of fact, when he wrote Treemonisha, it was simultaneous with the advent of Schoenberg’s sprechstimme, and sprechstimme was present in Treemonisha. And Joplin had no contact with Europe in any kind of way. This guy’s totally isolated and he’s just making music from an aesthetic. For music — in addition to drumming and rhythm and things like this — there’s an aesthetic in African art. And that aesthetic is so much different than the European in terms of form. First of all, most African music has nothing to do with form. They don’t deal in form. You know like a sonata form or a fugue form? They do not do it. It just happens, and that’s it. EI: It makes me think of someone like Pete Johnson. I know you’re a boogie woogie fan! Whatever Pete Johnson does exists in sort of an irreplaceable moment. Technically and spiritually, his creation is much harder to play than any étude by Chopin. EI: It comes from a completely differently angle. I think that angle doesn’t get enough respect, actually. HT: Right! Because there’s too much relating things back to the European format. Look how long it took for what we call an American school of music. You really don’t get to it until Charles Ives. EI: Guys like Edward MacDowell don’t hold up that great today, no. HT: MacDowell and Horatio Parker and the rest were students of European music. It took a very long time for the composers to turn to the folk elements. That was also the basis of European music. Folk elements all around the world. I don’t care how sophisticated it becomes, the folk element was the basis of any music. And [pre-Ives classical composing] Americans were skipping that, right? But back to your question about what I use and what I’m not afraid to use: I’m saying all these things to say that I’ve always understood how music got created here in America, and that I was under no obligation to do any particular thing. I do exactly the way I feel, whatever I want to do. That’s probably why I love Debussy so much. He did exactly what he felt like doing, even though he was European. EI: To go back to this idea that jazz was a moment. . .
HT: The word has to expand. See, we know nothing about all of the black classical orchestral writers. They are just left out of history basically. Somebody might have heard the name of William Grant Still or Ulysses Kay, but not really. But something that has happened in my time that never existed before: All of the composers know people like me and Anthony Braxton and Muhal Richard Abrams. Grant Still or Kay, they tried to make their music fit into that European model. And when I get a commission, they still make it fit into that European container, in order to get it played. This has been going on for a long time. But now, I don’t want any more commissions from American orchestras that are not ready to do what I want to do and go in the direction I’m going in…and learn something. Because we don’t process music the way they process music, either. We process music — when I say “we,” I mean improvising musicians; not all of them, but myself — I approach it through the word the Germans use for rehearsing: probe, which is in search of. Not to read something straight through and go in like, well, everybody read it and everybody pay the permit to get up and go home. EI: And forget about the rhythm when you get one of those orchestras! HT: It sounds so square. The reason for that is they’re still using a European model; they’re not getting up off of that and going with the other model. We don’t play music with the size beat that they play it. Our beat has a width to it. They play right in the middle on the beat. Their beat is so thin it’s like tick, tick, tick. Now when I had the Sextett, I used two drummers, and always had one drummer that played this far behind the beat and another drummer that played almost ahead of the beat. So the beat is that wide, so you could lay information in quite differently. You got a lot of room for laying information, and that’s the same thing that happens in Latin music. Mario Bauza told me about the wrassling match when the modern jazz guys came in and tried to play with the Latin cats in 40’s. The clave and the swing wouldn’t mix! Bauza said that Charlie Parker could bring the music together, but as soon as Bird stopped the wrassling match would begin again. Mario said that not even Diz or Dexter Gordon could do that, but Charlie Parker could. When you play jazz and Latin music, you have to take the beat and the time from the drummer, not the conductor. The conductor keeps those people in that narrow band, and that narrow band does not allow you to express anything. That only works with the European model. Of course, that’s legitimate! There’s nothing wrong with that. EI: Well, tell me about some of your drummers, like Steve McCall. HT: Oh, well, what can I tell you about Steve McCall? HT: Well, you have to be more specific. I know a lot of things about Steve McCall. He’s a great musician, an intuitive musician. EI: I love how he tunes his drums; I think it’s a very beautiful sound out of the kit. HT: A lot of music that Air played called for certain tunings. That’s why Air was able to have a certain dynamic. With just reeds, bass and drums, in a very short period of time you’re not going to have much dynamic orchestrally – time or color wise. And I’ve learned from being around Ahmad Jamal about the tuning of those drums. And if you listen to the first Air record, you hear those different tunings that I’m using. Steve, he had his own tuning when I didn’t have things called for specific tunings. The way he personally played behind the beat. I was never comfortable with people who played on the beat; I had to learn how to play with guys that rushed the beat, played ahead of the beat. I was always comfortable with kind of a Midwestern thing behind the beat. The way Lester Young played behind the beat. EI: I heard that Steve McCall really knew the street side of things. HT: He was the first one of us in Europe, and when Archie and all of them got there, he knew everybody. He played with Archie Shepp, went to Africa with Don Byas. McCall was the oldest, I was in the middle, and Fred Hopkins was the youngest. By the time we moved to Europe, he was a senior. He had lived in Paris, he had lived in Holland. He knew something about the Dutch, he knew a lot about the French and the Germans. EI: Whenever I see a photo of Fred Hopkins, I think this is the most handsome man! He really has a great look. HT: He is an incredible bass player. EI: For me, Fred Hopkins is essential for many of your greatest records. HT: You make music the same way you have baseball teams, football teams and basketball teams. The same way. That’s how its done, with some great key players. The Duke Ellington Orchestra would not have sounded like that with just anybody in the orchestra. Count Basie without Lester, Herschel Evans, or whoever was back there. It’s always that way. With the Chicago Symphony under Frederick Stock, there were key people in that orchestra who made that sound. It’s just like sports – it’s a team effort. People forget that, and sometimes they’ll just look at the leader’s name on the date. The musicians realize the blueprint. Their ability to open up your blueprint is what brings a work to life. EI: What was Fred Hopkins like as a person? He looks so gentle in the photos. HT: He could be quiet, then he could be pretty wild – when he was having fun especially! I met Fred when he was living next door to me, when I moved on 49th Street in Chicago. No one knew who was; he was working in the A&P, bagging groceries and doing things like that. I found out that he played when I heard him playing one day in the building next to me. I passed him and wondered who was playing the bass because I liked the way he played. We started talking at that time, and Steve came back from Europe and moved a little farther down the street. I was doing things on the North Side of Chicago, like experimental dance companies and experimental theater groups. Like when Grease and all that stuff came out on North Lincoln Avenue. It was a pretty wild period, a great period for theater in Chicago. All those things came to New York. This director asked me to write the music for a show called Hotel Diplomat, later called 99 Rooms. He gave me two books of Scott Joplin music, a volume of piano music and a volume of songs. He wanted me to use some rags in them, so I put the trio together. The first day that we started playing, we played the rags that I started orchestrating. So Fred developed a sound and a way of playing that was not coming from playing jazz standards or Broadway show standards. Those weren’t his references, although he loved all the great bass players like Wilbur Ware. Fred was from Chicago: if you come from Chicago, you have to love Wilbur Ware! Part of how Fred developed his sound was working on the Joplin music. There was nothing to listen to, anyway, for saxophone, bass, and drums playing rags. EI: It’s true that Hopkins has something in there like an older jazz, Pops Foster-type of feel. Hopkins played with you in the Sextett as well. What about Pheeroan Aklaff? HT: He and John Betch were the first two drummers in the Sextett. EI: I think Aklaff is someone who really understands how to bring pop and other grooves that feel really good and authentic in a sort of wild context. HT: That was the period when no one ever wrote about what I was doing with the drums. That was more drum music I had ever written in my life, for those two drummers. No one ever picked up that anything was written. EI: I noticed “The Theme from Thomas Cole.” The first minute or so there are absolutely no drums, there are only cymbals. There was one specific snare drum hit from one of them, but otherwise, it’s this blank canvas; so that when the other parts come in, it goes to a whole new level. That’s the sort of thing you are talking about, right? HT: Everything was written, just like every string part was written. The drums were tuned so that I had all 12 pitches, because we also carried two concert bass drums, if you ever noticed that. . .
HT: Well, listen to those recordings. Sometimes we used them, sometimes we didn’t. That means there are six drums for each set. Bass drum, two floor toms, two upper toms. So let’s say a bass drum, two floor toms, snare, that’s four. EI: So you wrote out parts for both of them? Wow! EI: I didn’t realize it was that extensive. HT: Both sets were tuned so that chromatically I could get the entire scale. One is tuned in fourths and the other tuned in fifths, because the bass is tuned in fourths and the cello is tuned in fifths. So I can get almost the entire chromatic scale, minus one note. Keep this in mind now that I told you about it when you listen to the Sextett records. I think we were in Berlin and Roy Haynes said something like, “It wasn’t a big band but it sounded big.” We sounded big because of the orchestration. The pre-orchestration is the sound of the drums themselves. It was almost like having 10 timpani on stage, and when you have the bass with E, A, D, G, and the drums are tuned to those pitches too, you know what you have, don’t you? Sympathetic vibrations! E-A-D is a huge note because it has been activated. The open strings on the bass open can be like a sitar. You listen to any records with two drummers playing, and then you listen to the Sextett record – see the width and size of the scale of the drums and how it impacts those instruments. See how the instruments blend in with these drums. Did you listen to Rag, Bush and All? Everything is tuned, heavily tuned. In Africa, the drums are tuned. EI: Live music is the best music, and I really wish I could have seen the Sextett live. At least we have the records. 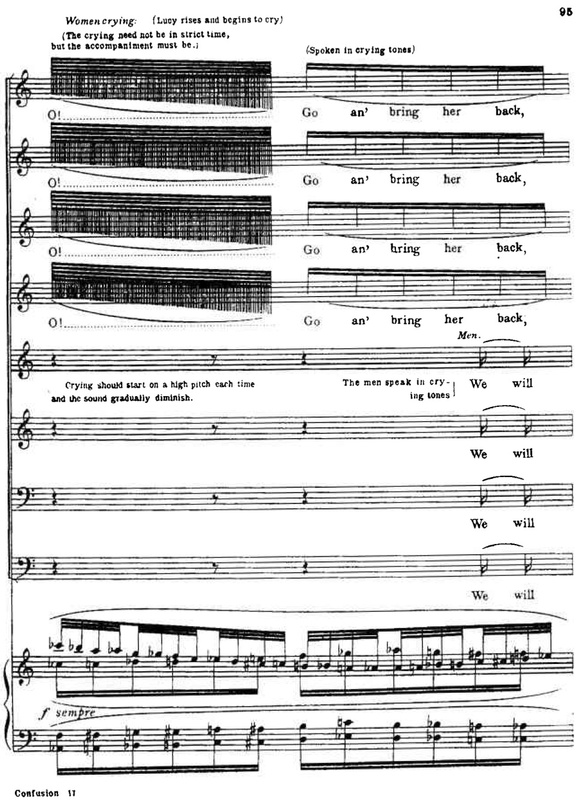 When you wrote for the group, did you write out a score, and then have a copyist do the parts? HT: I didn’t have any copyist! EI: So you wrote a score and the parts for everybody. That’s a lot of music. You must get up and write music everyday. HT: Well, no, I can only write at certain times, in order keep up with these instruments. You know, you don’t play for one week, your wife or your girlfriend knows; two weeks and you know; three weeks and everybody knows. I have friends who can do both. I can’t do both. I have to do one at a time. I write, and then I go to my instruments. I can’t keep up with the instruments if the writing becomes too demanding. EI: You wrote so much for that band. Sometimes I hear an element on the records that suggests you are almost reading it in the studio. Tiny structural errors and stuff like that. Is it true that you would come into the studio with new music? HT: No, it’s a way of processing music. I go into rehearsal to look for its discovery. What’s on paper is a place to start. I am playing, and then this guy plays this note wrong, and then I say, “Oh, really? Just keep it like that.” I say, let’s start at measure two, and someone thinks I mean start on the second beat. So I just say, “Hey, start on the second beat.” Also, when someone doesn’t play ’cause they forgot to come in. Well, that’s discovery. EI: That’s the element you can’t get with classical musicians. HT: No one has ever written about that. In orchestral music, the job of the conductor is to lift the music up off the paper, because it’s not all on the paper. Also, a good conductor deals with the acoustics of the room. A poor conductor follows the metronome markings while disregarding the acoustical information. A good conductor processes the hall. I do the same thing, but I process the form. Now with Zooid, form is in process with me. Before Zooid I had been working on interior parts in advancing harmony, counterpoint and getting rid of the method of improvisation that has lasted for a long time. I needed to go another way with improvising to have people play more spontaneously. Well, now form itself is in a state of improvisation. These little things you were talking about, the “mistakes,” affect form. The same thing happens in research labs where most of the discoveries are made through mistakes. The European template is a different way of assembling and processing the music. People keep that as a standard, but you can’t take the music that we are making and apply it to that standard. They are two different worlds. This has been going on for a long time and has caused major confusion, where people would write things about what I am doing or what someone else is doing and say, “Is that a European method?” No, it isn’t. I gather information and then I process the way I process. I come to rehearsal with much material that is written out, but that’s only a starting point. Everything is written out, but it also doesn’t mean a thing. The music is totally modular because what is here can be here or what is here can be there because this is what we discover in discovery. This is what needs to be brought out by music analysts and musicologists. EI: In this mutable music, the musicians are so crucial. Tell me about the cast in Zooid. HT: Christopher Hoffman is with us now, the cellist, he just joined as the sixth member. The band started with Taruy Brevrey on oud, Dany Leon on trombone and cello, Liberty Ellman on acoustic guitar, José Davila on trombone and tuba and Elliot Kavee on drums. We rehearsed for a year before we appeared. It was impossible to appear otherwise because when I left off with Make a Move, I had abandoned the major/minor system, and it appeared on the first Pi record with Brandon Ross and Stomu Takeishi. So it took them a year to learn this language. It wasn’t about the difficulty about reading the notes – these guys could read fly paper, all of them — but to learn the language and a type of independence. Collective improvisation has been an important thing to me, always. Now everything is truly independent; no one can really depend on anyone else. I like harmony. I haven’t abandoned anything. Counterpoint is there, but the harmony is an illusion. You hear this harmony, but we aren’t really playing it, and we aren’t improvising on it. One piece of harmony can have as many as 14 faces. EI: What do you mean by that? HT: Let’s say the sound of C, C-sharp, F-sharp; it can have the face of G, C, E-flat, maybe. It can have the sound of E-flat, F, E. It can have the sound of F-sharp, G-sharp, A — because it comes from a family. This family is like your biological family, like your brothers, sisters, mother and father all share DNA, it is the same thing. This has nothing to do with major/minor substitution. EI: It must have to do with intervals. HT: It has to do with intervals, but interval groups that are born from two parents. EI: This sounds like tri-chords. HT: No, absolutely not. C Major and C minor are the same thing. One is feminine and one is masculine, in my world, so the mother creates so many children, and the father makes so many children. Between the two of them, I can get as many as 14 children. Let’s stay with the idea of children. There are three factors in this family. You, your brothers and sisters, everybody has got one ear, brown eyes and a big thumb. If 15 children, they got more than that. Some of them got one ear, three eyes, a brown eye and a blue eye, you see what I’m saying. That’s why I said that one thing can have 14 manifestations of itself. I’m speaking in terms of harmony, but it’s true with everything that’s moving, that you are listening to. You have played some of my older music, but you haven’t played anything recent music at the piano. EI: [To “audition” for this interview, I played a little bit of Threadgill music on the phone to him the previous day.] I was trying to learn some of “Polymorph,” but it was beyond me, and now I’m beginning to understand why. HT: Students from universities have studied some of my earlier work, but that was when I was writing in the major/minor system. Now, when you start to follow the contrapuntal lines, you see that everyone is starting to play something different, moving in counterpoint. They still have their freedom, but there is set of numbers of intervals, and everything that is happening is moving according to voice leading. There is no random voice leading. If there is no minor second and I play a minor second, I destroy the interior of everything. EI: It doesn’t sound like 12-tone music, but is it spiritually aligned with having a system like that? HT: It has nothing to do with serialism at all. In serialism, you have a series of notes. Could be 12 notes, five notes, whatever the series is. Well, this is a series of intervals; the first series is five, then four, and the next one is seven, and the next one three, and the next eight, and the next four, and every one of them is different and they exist for period of time. The written music that’s on the paper, everything is moving according to that. Not necessarily every interval that is up there, but when we improvise, we can take a lot of liberties because that is what the musicians have learned how to do. Now the players with me, they can do anything they want to do, because if you understand what you can and cannot do, then that means you can do everything since you understand those two things. EI: I can perceive order on the Zooid records, and it’s interesting to hear that it’s so well organized. In a way, your music with Zooid reminds me of late Stravinsky, after he embraced composing with intervals in a non-major/minor kind of way. HT: Stravinsky used everything he found. When you make art, you can’t say “you can’t use that” or “can’t use this.” It’s not like religion. It’s not like I am practicing a part of the Catholic liturgy, and then I’m over into some stuff from the Hebrew world and then I shoot over to Buddhism . Yes, people are going to object to that. . . I am listening to the way they organize sound in Bali and the way they organize sound in South India. Whatever I can learn from that, I learn from that and integrate it. See, with the American Experience, black people and Chinese people had the American spirit, but white Americans almost forgot about it! They didn’t have any information after they left Europe, other than imitating Europe. Finally, when you get into Appalachian-American and Hillbilly Music, which I grew up with, you see the beginning of the roots of the material of another experience in America. Rock and Roll sprang up because new elements here were kind of being denied. America was isolated in the first place. We started to learn things and process things in their own isolated way, and everyone else in America was doing the same thing. Black Americans didn’t look to Europe as a template. The interesting people like Ives and Copland: when you read their writing, they are saying what is going on in America, how America is thinking. In their process, in the way they process, they are telling you about the thinking in America at that time. How they were breaking out of a type of isolationism and also a type of imitation-ism as well. EI: Talking about Fred Hopkins, I have also been listening to Stomu on these Zooid records, and there seems to be a connection in the way that the bass sounds. I think Stomu is a phenomenal bass player. HT: All of these players – I have been really lucky. This is one of the best groups I have ever had, ever. It’s quite incredible. The dedication of these musicians to the music is 150% all the time. I have never had a group this size with this type of commitment. These guys are at rehearsal on time or before me. I don’t write anything for Elliot [Humberto Kavee] anymore, maybe a note here and there. It’s very difficult to figure out what we’re doing, too, because it sounds like we are playing in ¼. That’s because I never allow the drums to play in the meter I am playing in. That won’t happen. EI: There is no downbeat. HT: You can’t tell. You don’t know. It’s funny when people say things like, “The section in 5/4,” and I say, “I’d like to know where that was,” and the band would say, “We would, too. I don’t know where you heard that!” because basically I think in ¼. Beat to beat, penny to penny, dollar to a dollar. I don’t need drums to play in the same meter the band is playing in because that’s really redundant. In rhythm, they talk about secondary beat, the first beat, and the first accent and the secondary accent. When you put meter against meter, that’s what you get. So now you lose all meter, and that’s really what I want. I don’t want any sense of meter because when you sense meter, you see and feel division. This is over, and this is coming next. It gets in the way of the flow. The flow is everything in film, everything in theater, everything in literature, everything in architecture, everything in dance, everything in music. Boxing or barring music for me is over. In bars of 4/4 to the next bar of 4/4 or bar 4/4 to bar of something else you feel the demarcation. The demarcation has interrupted the flow. It inserted itself into the picture in the form of some kind of physicality that takes away from the big picture. You want to see the forest, not the trees. EI: Tell me about the tuba. You have had so much tuba in your music for so many years. HT: Well, after the period with Fred, I couldn’t find any more bass players. HT: Not that there weren’t bass players, but I couldn’t find anybody that. . . You come to New York, and people are finished because they think that they’ve finished their process. They come here not to woodshed with anybody. We [Air] came here as a group and we woodshedded before we came. We didn’t come here to get our stuff together. We had gotten our program together and came here. What I found very difficult in that stage of my life in New York was to get people spend time with as a group. I was lucky with the Sextett, but I still had Fred and I had Muneer Abdul Fataah before Diedre Murray. Unfortunately, Muneer he didn’t get a chance to record with us, he left to move to Europe. [Back to tuba.] This is what happened: I formed in the Wind String Quintet. The Wind String Quintet never got recorded; it’s the oldest group I have outside of Air. EI: Was it related to the X-75 stuff? No? HT: No. When I first started writing for it, it was violin, viola, cello and bass, with me playing woodwind. It didn’t work with the bass, and I put a tuba. The tuba was the only thing that had the material, the same material that I had in terms of the instrument. The tuba can lock into the wind world in terms of orchestration! I had four strings over there, and I had no sympathetic anything with them, no sympathetic material. I didn’t have no brass, no gold, whatever. With the tuba, I had brass and that could lock in another kind of way. Also, I didn’t like the bass response time in this kind of context. I did a lot of music for the Wind String Quintet; it started off with Bob Stewart. Marcus Rojas learned how to play. He didn’t even improvise when I found Marcus; he came through the Wind String. I had Marcus Garvey’s grandson in there. I had all kind of players in there, great string players like Diedre Murray, Corey Dixon, and Leroy Jenkins. I had three or four commissions from Carnegie Hall that most people don’t even know about. EI: Do you still have the scores? HT: Yes, I still have the scores and the tapes. EI: I hope those come out sometime. HT: We played Town Hall, and all over. No one was ever gonna give me a recording date with that! It took us forever to get a recording date with the flute quartet. In the jazz world, they went, “What is this flute quartet?” Took Bonandrini to allow us to make a record for him. [1990’s Flutistry by the Flute Force Four.] The Wind String group, I did a lot of theater and dance things with them over the years, and Tom Buckner always would put us on his Interpretation series. So that tuba goes back to the Wind String Quintet. I wasn’t coming from the European concept of a String Quartet and adding woodwind. I was coming from some place else, and I was looking for a different kind of blend. It was already strange because the string quartet would have been two violins, a viola and a cello, but I had violin, viola, cello, bass, and then I took the bass out and replaced it with a tuba. EI: Sounds like with the tuba you get to move those strings around a bit more. HT: Yes, it can blend into the strings section. The bass can’t blend and go from section from section quickly like the tuba can. It can go into the brass section and come out the wind section and go into the string section, and it sits in there like a ghost. EI: I have laughed many times listening to your records, listening to these high tuba parts, two octaves above the bass. They bass and tuba can play close to each other or really far apart. José Davila? Where is he from? HT: He’s Puerto Rican, but he is from Connecticut originally. He grew up in New York after coming here, going to school in Connecticut. EI: He sounds great on those records. HT: And his trombone playing is on another world, all by itself. I did electric with Very Very Circus and Make a Move, and I was finished with that. I couldn’t drag that on over to this new sound. I was hearing something, that’s why I went to the oud. I was trying to approach the expansion of the octave, with quarter tones. We been working on expanding the octave for a little while, incrementally. I’m not interested in what other musicians pick up from it, really, but I have a need for my palette. EI: It seems to me that you look forward, you move forward.